Since February, I’ve been on sort of a health kick (i.e. not eating lots of junk food like biscuits, chocolate and Taytos) because it turns out that I accidentally put on 2 stone in the six months leading up to Christmas. I don’t know how it happened… actually, I do. It was probably down to all the full packets of biscuits, giant bags of Doritos and mountains of chocolate I was eating every week. So for the past two months, I’ve been watching what I’m eating in order to lose the excess weight and now I’m down half a stone. I could be eating a lot less and restricting my diet a lot more in order to lose the weight faster, but I want this to be a more gradual thing not just crash dieting until I lose the weight and then going back to eating loads of crap food. So I got this amazing app called Nutracheck which helps you track all the calories you eating and burning. I’ll tell you more about this app in the future because I’m planning to write an entire review about it. When I first signed up for it, I was asked what my current weight was and what my goal weight was and then it calculated for me that I should try to only eat 1400 calories a day in order to get to my goal weight, so that’s what I’ve been trying to do. Also, since I’ve been watching my weight and trying to get healthier, I’ve been obsessed with blog posts and videos about healthier snacks and what people generally eat in a day so I thought that I might try it out and see how I get on. It will be a good way to watch what I’m eating and hopefully, you might find it interesting too. Yesterday, I woke up late. I’ve been trying to wake earlier every day at about 7am because it makes me feel so much more productive, but I gave in to the snooze button and slept until 10. For breakfast, I had some Ready brek made with skimmed milk and some sultanas sprinkled on top. It was actually my first time adding sultanas to Ready brek and I really liked it (I’m already craving more as I’m writing this). I had to go to work at 1pm so I just ate a light snack of some Aldi Savour Bakes Thins (cheddar and cracked black pepper) and a tall glass of water. These have a fairly strong flavour so I like to eat them plain without any spread on top. I had really only just had breakfast and I wasn’t that hungry so I went for a quick snack in case I would get hungry in work. When I came home from work at around quarter to six, I was so tired that it took me ages to actually get up off the couch and make dinner. I had a stir-fry with chicken, half a courgette, fine thread noodles, thyme, a spoon of curry powder and a dash of soy sauce. This is one of my favourite dinners because it’s really tasty and pretty low in calories. I know I said at the beginning of this post that I was cutting out chocolate but I do allow myself a small treat twice a week. 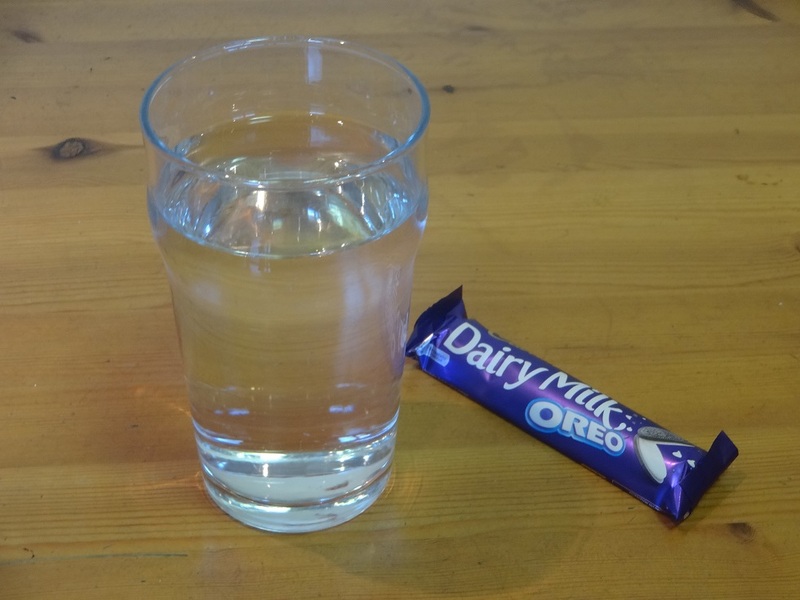 So because I still had nearly 600 calories left for the day, I had one of my favourites, a Dairy Milk Oreo bar with a pint of water. I am literally in love with these bars. If I could eat them all day, I probably would. One of the best ways to suppress my hunger in the evenings is to drink a hot drink. On a good day, it’s a cup of green tea, whenever else, it is a cup of hot chocolate made with skimmed milk. It really helps with the chocolate cravings, although I had just eaten a chocolate bar so I wasn’t really having chocolate cravings. I added a marshmallow to make it a bit more fun and that I was all I had for the rest of the evening. I hope you enjoyed this different sort of post. I’m thinking about doing it as a sort of series that I post once a week or once every two weeks. Let me know if it is something you would be interested in or if you find this kind of thing really boring. If you like it, please make sure to save it on Bloglovin or give it a +1 on Google Plus. I’ll talk to you guys soon.